Green has always been the colour that’s associated with the preservation of the planet, but Winterhalter’s BLUe environmental policy adds an alternative shade to the archetype. It focuses not only on creating cleaning products which are both user and world-friendly, but also strives to only use packaging that makes a minimal impact on the environment. The core ethos of the range is on replacing harmful ingredients, implementing an effective ISO14001 approved Environmental Management System. This has been managed seamlessly, for example, with the introduction of sustainable surfactants in washing-up liquid. Traditionally, these would have originated from oil but have now been replaced with vegetable extracts. All BLUe products have natural fruit fragrances, contain no harmful additives and are phosphate free, septic tank safe and not tested on animals. Such an emphasis on low impact ingredients does not have to mean a shortage of customer choice or effectiveness. 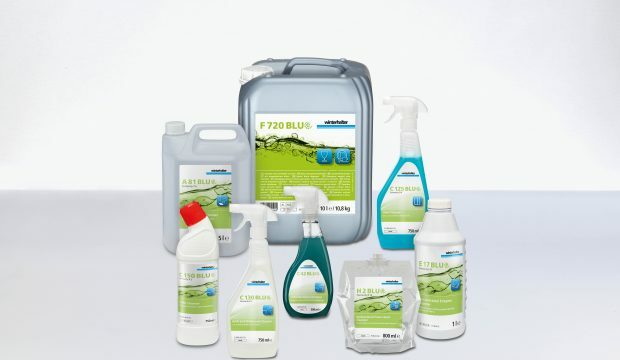 The BLUe range provides an extensive selection of high performance options for both catering and housekeeping operations, with 15 ready-to-use products, including dishwasher detergent liquid, enzyme floor degreasers and toilet cleaner. Meanwhile, as part of the quest to save space and reduce both waste and pollution, there are also ten concentrate products available, providing a more long term solution to standard cleaning products. A single 2 litre bottle of concentrate, for example, produces 100 x 750ml flasks when diluted. Not only has the focus been placed on what’s inside the bottle, but also the container itself. Winterhalter has created plastic vessels that are refillable and easily recyclable due to the fact that traditional paper labels have been replaced with plastic ones, eliminating the need to separate components for disposal. Reusable triggers and sprays are also used.